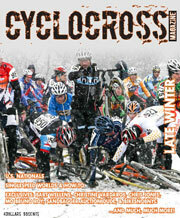 Cyclocross Magazine Issue 15, with Lawrence Malone on the cover. For less than just one race entry fee, you can get months of ‘cross bliss, without the suffering. We have a few options: A standard 4-issue subscription for $22 (17% off the cover price, but the challenge will be finding it), and a supporter’s 4-issue subscription, which at $25 helps us get grow and produce more issues. There’s even a benefactor’s option (which merely helps us ramp up faster and makes you feel good), an option for Canucks, and an international option (surprisingly, we have a good European following). When ordering, please make sure you receive a receipt from PayPal in your Inbox. Haven’t gotten one? Email subscribe [at] cxmagazine.com to make sure that your order went through. Print and Digital Subscription Combined – Save 13%! We’ve had so many requests for this, it’s time to offer it. For one low price of $46 you get 4 issues of our print mag, plus 12 months of access to our digital archives and future digital issues on uberflip.com. That’s $12 off the individual prices, and you save over $100 compared to buying all those back copies in print. Choose a username and password for digital access, and we’ll get you set up in a day or two. 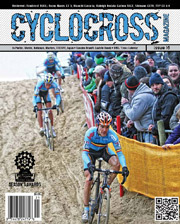 Please see below for our list of in-stock Cyclocross Magazine back copies. Issue 1 – Sold Out! 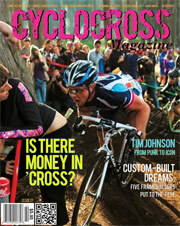 Get the rough, ambitious, first-ever 100% cyclocross magazine! This one featured interviews with Jonathan Page, Katie Compton, a confessed sandbagger, a how-to article on making Campy and Shimano work in perfect harmony, letters of ‘cross love, reviews of TRP’s Euro-X brakes, and a spotlight on a cross-dressing ’cross series. Issue 2 – Sold Out! 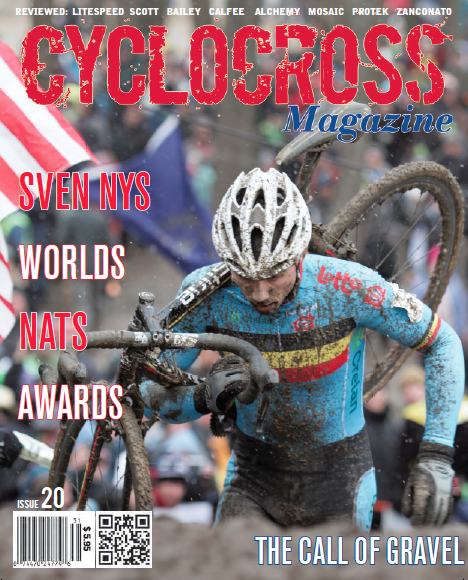 Our Late Winter issue is filled with interviews of EVERY national champion crowned at the Kansas City National Championships, an Interview with Bart Wellens, bike reviews, a feature on the eBay sandbagger auction, Singlespeed Worlds coverage, and much more. 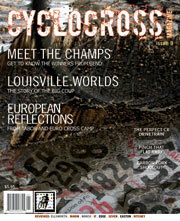 Issue 3 – Available Again!, our Early Summer issue, had interviews with Luke Keogh, Josie Jacques-Maynes, Rachel Lloyd, a feature on Louisville’s Juniors, a look at the ’08 Worlds and NAHBS, reviews of almost all available ‘cross clinchers, an overview of tubeless tires, ground-breaking research on tire pressure, a cowbell-shootout, and columns from Christine Vardaros, Vicki Thomas, David Perez, and Mike Birner. Issue 4, our Fall Issue started mailing in October, and features interviews with Sven Nys, Matt Kraus, and Laura Van Gilder, features on the Clif Bar Development Team, Three Peaks, seven bike reviews (Motobecane Fantom Cross, Bianchi Carbon Cross Concept, Ellsworth Roots, BMC Cross Machine CX01, Salsa Las Cruz, Trek XO2 and the Time Cross ProTeam), a tubular tire and winter shoe buyer’s guide, secret training tips, and much more. It’s a fat one at 100 pages. Issue 5, our Winter Issue mailed in January, and features interviews with Lars Boom, Tim Johnson, Helen Wyman and a top unicrosser, features on the Rad Racing Team, a look at the Seattle opening weekend of Star Crossed and Rad Racing GP, a heckling primer, reviews of the Giant TCX0 and Leopard CX1 and much more. And we return to the grassy knoll for another CXM Labs tire pressure speed test. Another fat one at 100 pages. 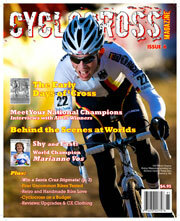 Issue 6, our Late Spring mailed in early June, and features a first-ever U.S. cyclocross history overview, interviews with all 2008 National Champions, World Champ Marianne Vos, a look back at 2009 Worlds, reviews of the Blue CXC, Bailey Miniluv, Stevens Carbon Cross Pro, a look at more ‘cross DVDs and books, and much more. Issue 7, our Early Season mag mailed in mid/late September, and features an exclusive interview with World Champ Niels Albert, a profile of newly un-retired Alison Dunlap, a look at Iron Cross and the Crossniacs club, pointers for newbies and triathletes, pedal, brake pads and brake reviews, brake set-up tips, reviews of bikes from Scott, Pedal Force, Soma Fabrications and Fuji, and much more. Issue 8– Print Edition Sold Out, Digital Version available, our Late Season mag mailed in January, and is perhaps our best yet. It features exclusive interviews with 2010 World Champ Zdenek Stybar and U.S. National Champ Katie Compton, along with profiles on Molly Cameron, Ali Goulet, Jeff Bahnson, and filmmaker Brian Vernor. We also featured a look back at Allez Allez Zimbabwe, we chat with a handful of UCI officials, and have a great how-to article on racing at the back with class. In tech, we have the authoritative article on fork chatter, review a slew of cyclocross wheels, play with air compressor triggers, and review the Redline Conquest Team, Ibis Hakaluggi, Focus Mares Team, Habanero Cross, and Bianchi Axis cyclocross bikes. 100 pages with three times the original content of other mags. Get instant access to the color-enhanced digital version of this issue right now with a subscription. 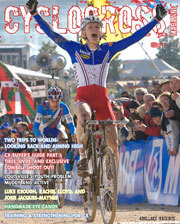 Issue 9, our post-season issue, wraps up the 2009/10 season in a big way, with our annual interview with EVERY winner of the 2009 National Championships, and exclusive behind-the-scenes looks at the Tabor World Championships and the EuroCrossCamp. It also has a carbon cyclocross fork shootout with reviews of the Ritchey WCS, Alpha CX20, Edge Composites, Easton EC90X and the Seven Cycles carbon cyclocross forks. 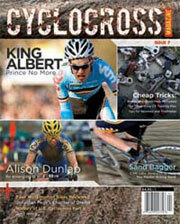 We also look at the the perfect cyclocross shifting system, with Di2-like performance. 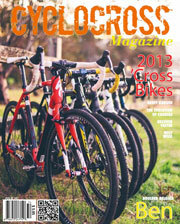 We review the Bianchi Axis, the Ellsworth Roots, the Marin Cortina and the Norco CCX SL cyclocross bikes. 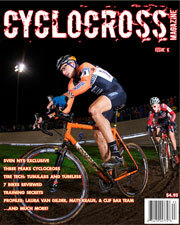 Plus a whole lot more in 104 pages of content-packed cyclocross goodness. Get instant access to the color-enhanced digital version of this issue right now with a subscription. 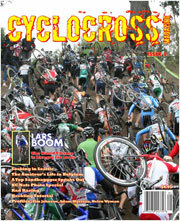 Issue 10 looks ahead to the 2010 season with flair – our grassroots magazine keeps all the ’cross grit, but brings in some glamor with our first full-color issue! Sports psychologists talk about how to use your mind to overcome your body-matter, USA Cycling uses a time trial for the Nationals’ start order, coach Chris Mayhew talks race tactics based on a rider’s individual strengths, and some of the best roadies-turned-cyclocrossers out there – including Meredith Miller, Chris Jones, Laura van Gilder and Davide Frattini – look at how to harness the roadie power and put it to work on a ’cross course. Get to know Jake Wells and Kaitlin Antonneau, learn about racers who commute to events (and how they do it) and get some pointers from top cyclocross photographers so you can glorify your exploits. 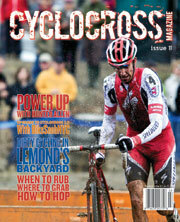 We also check out Monstercross, review the Vassago Fisticuff and Cinelli Zydeco bikes, go single-ringing, look at new tire options and more! Get instant access to the digital version of this issue right now with a subscription. Issue 11, our 2010/2011 mid-season installment, had many readers asking how many “best-ever” issues are possible. Well, in theory, all of them (and thanks!). We bring a rare look at Greg LeMond and learn about his soft spot for ’cross – and the course he’s built on his land; Hunter Allen shows how to use a power meter for our sport; and BikeSnobNYC upgrades us all to Cyclocross 2.0. We also take a hut-to-hut trip around Oregon’s Mt Hood, look at how much rubbing is just part of racing, compare the North American and Euro cyclocross scenes, learn about bunny hopping, and meet Barry Wicks and Klaas Vantournout. Tech reviews include a long-fingered glove roundup, an assessment of sunglasses (prescription and otherwise), and reviews of the Boo CX, Slingshot DD-X, Specialized Crux Comp and Van Dessel Full Tilt Boogie. Get instant access to the digital version of this issue right now with a subscription. Issue 12, our late-season issue, follows cyclocross from its sprouting grass roots in Indianapolis all the way to the sport’s top stage, where we bring you exclusive access to Katie Compton’s Worlds whirlwind. We also present profiles of each and every US national champion for the fourth straight year, and add a gorgeous photo gallery by Joe Sales. 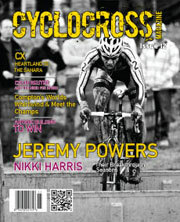 Features on Jeremy Powers and Nikki Harris celebrate their breakthrough seasons, Colin Reuter of Crossresults.com explores the competitive nature, and 70-year-old Roland Hurtecant shows that cyclocross isn’t just for the mud and fields as he relives his ride from Belgium through the Sahara to Algeria. Mechanics reveal must-do maintenance tips; tech reviews include the Cannondale Super-X, All City Nature Boy, Fuji Altamira CX 1.0 and Stan’s NoTubes A340 Comp wheels; and we show how to build an aerobic base to prepare for the upcoming season. Get instant access to the digital version of this issue, complete with 20 bonus photo pages, right now with a subscription. 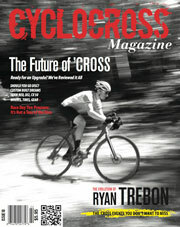 Issue 13, which mailed in July, 2011, brings a New England flavor to our summer edition with a feature on the Jericho, Vermont, standouts Amy Dombroski, Jamey Driscoll and Lea Davison; a profile of Tom Stevens, the “Christo of American Cyclocross”; and a report on a spring camp for Juniors in Northmapton, Massachusetts. 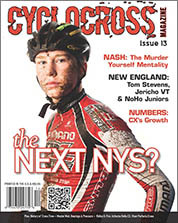 We put a 16-year-old on the cover with some bold words: Could Logan Owen in fact be “The Next Nys?” Other features include a look at Czech champ Katerina Nash and her “Murder Yourself Mentality,” an analysis of the growth of the sport and an in-depth look at the history of ’cross tires. On the tech side, CXM Labs gets in the mud to see if deep-section wheels provide any advantage, pro wrench Daimo Shanks reveals how to keep your various bearings in working order, and we give a primer on tire pressure in our Newbie Nook. Reviews include the Ridley X-Fire, Airborne Delta, Viner Perfecta Cross and Nine-Gs wheels, and Christine Vardaros and Erik Tonkin check in with columns.Get instant access to the digital version of this issue right now with a subscription. 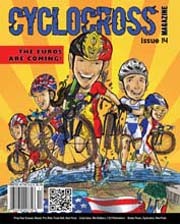 Issue 14 is the “Euro Invasion,” profiling Euros making their way to the US for racing. We also profile Niki Dallaire’s “Irrepressible Spirit” after she bounces back from a life-threatening injury and Linda Sone, who balances a challenging job as a firefighter with mixing it up at the front of Elite cyclocross races; we turn the lens on three seminal cyclocross filmmakers; and we bring the popular CX Comic to print for the first time. Cyclocross stalwart Bart Bowen teaches us the mount/dismount, chiropractor and coach Seth Hosmer brings us a great foam roller routine to maintain our bodies all season long, and CXM Labs quantifies the braking power of different setups and launches the “Cheap Bike” project. Experience the Green Mountain Double Century in Photos, and learn how heat acclimation can make you faster – in hot or cold conditions. Reviews include the Raleigh Hodala with Gates Carbon Drive, Traitor Crusade SS and Skuut kids bike; TRP’s and 324 Labs’ hydraulic disc brake adapters; and wheels from Cole, Zipp and Rolf. -The story of the McCormack brothers, Frank and Mark, who defined the sport in this country for a decade. -A contemporary grassroots American cyclocross story, set on an airstrip in Central Idaho. 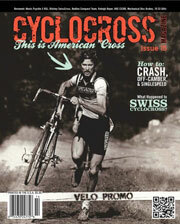 -A look back at Swiss Cross and a country that dominated our sport in the late 1970s and early ’80s. -Build and race a singlespeed. -Reviews: the Redline Carbon Conquest Team, Ritchey Swiss Cross, Raleigh Roper and Moots RSL Psychlo X. Issue 16 wraps up the 2011/2012 season and mails late February, 2012. This is our most photo heavy issue yet, and we feature events worthy of the extra shots. We encapsulate Nationals, Worlds and Masters Worlds in Louisville in words and lots of images, as well as a profile of cyclocross in Japan and a colorful look back at San Francisco’s rendition of SSCXWC. Issue 17 just might include some of our most important work, with investigative reporting into whether racers can actually make a living racing cyclocross. If we want our sport to grow, and keep its talent, we need to understand the realities of professional salaries, and we uncover these realities for our readers. Ever heard of Tim Johnson? We look back into the star’s early days as a punk kid and his transformation into an icon. We also take a humorous look into the process of finding a cyclocross team, give you tips on how to add intensity to your training, and review the latest cyclocross bikes and gear. Plus interviews with Andrea Smith and Travis Livermon and much more! 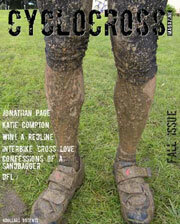 Issue 18 is our biggest ever, with an amazing diversity of content for all cyclocross racers, fans, and gearheads. We take a look at the latest in cyclocross tech, including disc brakes, Shimano Di2, CX50, SRAM Red 2012, and a massive roundup of cyclocross wheels and tires. Dream of owning a custom cyclocross bike? Part 2 of our Considering Custom series continues with early impressions of three bikes and builders. Need somewhere to ride all this new gear? We look at the growing number of permanent cyclocross parks popping up in this country. Think you know Ryan Trebon? We dug deep to get to the roots of Treefarm—and end up with the fascinating in-depth story of the two-time National Champion. We go behind the scenes with Brian Matter, Richard Feldman and Christine Vardaros. Looking to achieve some racing goals? Check out our exclusive training tips to help you achieve mid-season fitness and avoid a common pre-race mistake. And don’t miss our investigative journalism as we continue our “Money in Cross” series, as we look at the financials of race promotion. 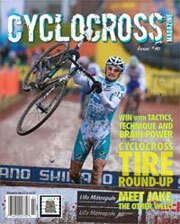 Lastly, be informed and entertained by our cyclocross lexicon, analysis of cyclocross culture, and tire pressure tips. -The New Off-Season Craze: Gravel Racing Takes Over the US… and gives cyclocrossers an excuse to stay in the dirt after the season is over. We look at the phenomenon, from the races across the country to the bikes racers are choosing. 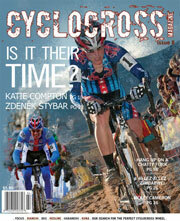 Buy Your Back Copies of Cyclocross Magazine Here!